Who is your computer talking to? Your browser isn't the only application that's sending data online. Your word processor might be phoning home; a file undelete utility might be talking to its mother ship, and even Windows' own services may surprise you. These are not necessarily nefarious actions, but they're worth knowing about. GlassWire is a free and beautiful utility that lays all of this bare. 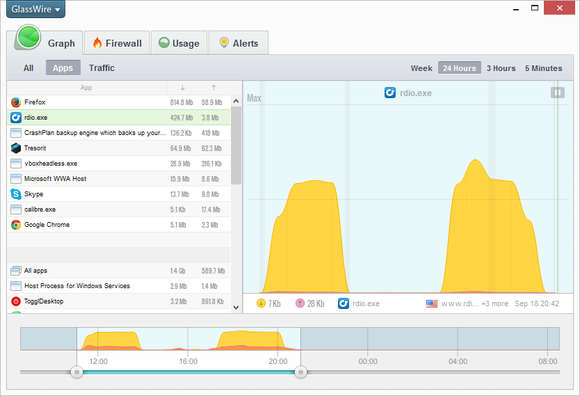 GlassWire makes network traffic fun to watch. 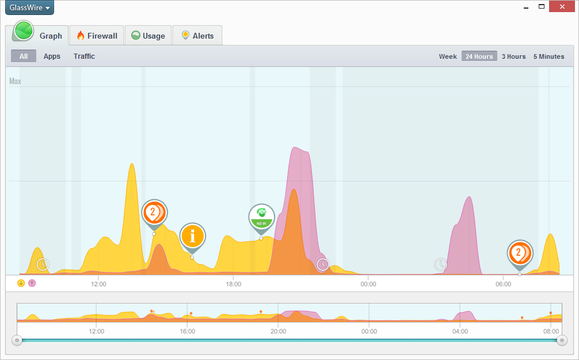 One of the most important things about GlassWire is that it's beautiful. This isn't a minor detail: For many users, network security is equal parts daunting and tedious. Having a tool that's just fun to pop open and watch throughout your day makes a big difference. The graph scrolls in real-time, and there's a zoom slider across the bottom of the window letting you check out longer periods of time at a glance. What made that traffic spike? When you see traffic suddenly spiking, you can easily drill in and find out exactly which application(s) on your computer caused that spike, and which Internet hosts they were communicating with. The graph also makes it easy to tell apart outbound traffic (uploads, shown in yellow) and inbound traffic (downloads, shown in pink). You can zoom out, and filter by app. To get a bigger sense of what your network traffic looks like, you can zoom the graph out to show three hours, 24 hours, or an entire week's worth of network activity. There's no lag when you do this: All filtering operations are instant. The graph then lets you filter activity out by application. For instance, what does Rdio's network traffic look like? How much data does it download over a day of listening, and does it use the network constantly or in brief spurts? GlassWire makes this both easy and fun to determine. Next, you can filter network activity by protocol. This can reveal some surprising information in itself. For example, I use a webmail client: I don't have a traditional email client such as Outlook, so I did not expect to see any SMTP activity on my computer. GlassWire reminded me one of my applications does send data to the Internet over SMTP—and it's not an email client. See an app you don't want communicating? Just block it. Because it gives you such a wealth of information, it only makes sense for GlassWire to also let you do something with your newfound knowledge. That's where the built-in firewall comes in. 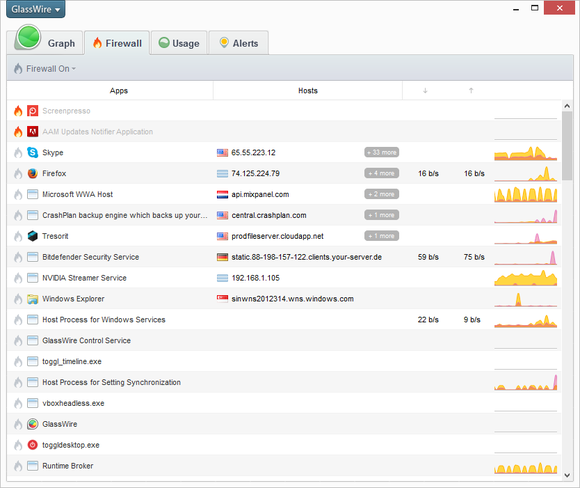 The Firewall tab lets you review the list of all apps communicating, each with its own miniature traffic chart. It also lists which network hosts each app communicated with—and a single click will muzzle that app for good. If you already use a firewall you're happy with, you can disable GlassWire's built-in firewall from this same tab without having to dig through a Settings dialog. 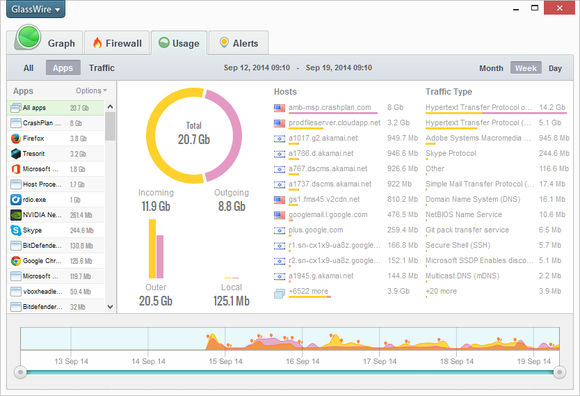 The Usage tab gives you a broad overview over how much bandwidth your computer uses. A line chart is handy for tracking traffic over time; but for cumulative total, something like a pie chart works better. That's what you'll find on the Usage tab: A simple and lovely look at your traffic totals for the day, week, or month. This tab uses the same zoom slider as the Graph tab, making it possible to pick your own custom durations and zoom in on traffic spikes to see how much data was consumed, and by which apps. If you use a metered connection, if your ISP claims you haven't been reasonably using your so-called "unlimited plan," the Usage tab offers invaluable totals. The Alerts tab shows what's been going on while you were away. Finally, there's all the traffic that's going on when you're not even using the computer. After all, your apps don't need you to be there to communicate. Some may even patiently bide their time, waiting for the keyboard and mouse to become idle for some time, before they start talking to their control servers or network peers. 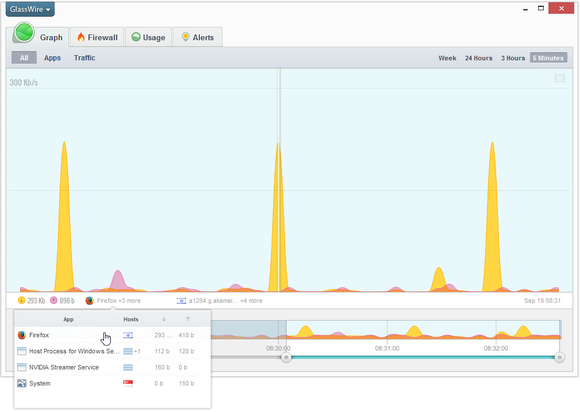 Like everything else GlassWire monitors, this is not necessarily nefarious: Maybe your online backup app simply doesn't want to slow down your connection when you need it. Still, keeping tabs on these things is healthy, and that's what Alerts are for. When you unlock your workstation, GlassWire also pops up unobtrusive messages next to the system tray to let you know if anything important happened. 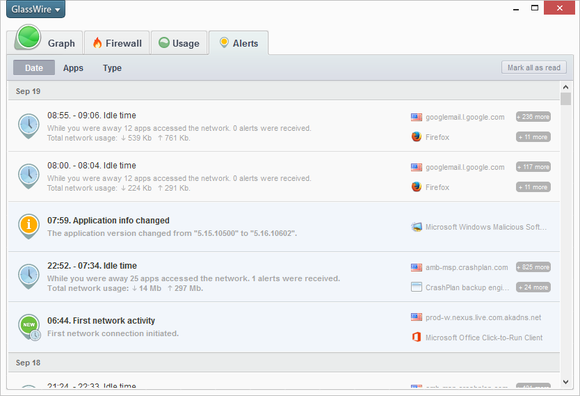 GlassWire's doesn't just make it easy to learn about your network activity: It actually makes it fun. That is its biggest triumph, accomplished through beautiful design and a zippy, responsive interface. Unlike many other security apps, there's nothing alarmist about it, and it doesn't attempt to upsell you on anything. The app is entirely free, although a statement on the developer's website says it intends to "add new features in the future for paying supporters." This very attractive utility does a great job of monitoring your network activity, and its built-in firewall lets you instantly block anything suspicious.